Gamaliel: [to Paul] Saul Paulus, be careful. Leave these men alone. If this idea of theirs is of human origin, it will collapse. But if it comes from God, you will never be able to fight them, and you will risk finding yourself at war with God. Without the contributions of Peter and Paul to the early Christian church it might very well have gone on to be an obscure offshoot of Judaism and Jesus might have died a lonely and forgotten death. 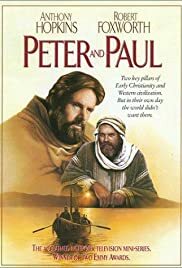 This film, Peter and Paul, is based on their contributions in spreading the gospel. Robert Foxworth is a rugged Peter, along the lines of Finlay Currie and Howard Keel previous portrayers of St. Peter, who also looks like a man who worked outdoors and with his hands. Anthony Hopkins is the scholarly Saul of Tarsus, rabbi who was charged with the apprehension and elimination of this Jewish sect worshiping a carpenter who allegedly rose from the dead. To mark his change of mind about this group, Saul changed his name to Paul and his forcible conversion on the road to Damascus is shown here in detail. The bolt of lightning that knocked him off his ride and blinded him and his later restoration to sight changed him 180 degrees. He becomes their champion and their most eloquent spokesperson. Paul before Peter took the commandment seriously about the new faith being universal. Others of the early Christians wanted to do the work of evangelizing strictly amongst the Jews. Peter was caught between a rock and a hard place on the issue. Undaunted Paul goes out among all various and sundry folks spreading the word. His travels are recorded in the names of the various books of the New Testament, his letters of commission and instruction to the various churches he founded. Whatever one's view of Christianity is, for better or worse Paul's probably the guy who did the most to spread it. That is indisputable. Anthony Hopkins combines the intellect with the personal magnetism that the man had to have in order to get as many folks as he did to listen and heed. You will find some other good performances in Jose Ferrer as Rabbi Gamaliel teacher of Paul who thought that we ought to give the new followers of Jesus a hearing, Raymond Burr as Herod Aggripa, Jon Finch as a worldly St. Luke and John Rhys Davies and Herbert Lom as Paul's traveling companions Silas and Barnabas at different points of his life. The direction is good, the script is literate without some of the banal lines associated with DeMille productions. Had this been done thirty years earlier, Peter and Paul would have had far more acclaim than it got. Still I think Christians will like it and nonbelievers will find it entertaining and factual in terms of the accounts in Scripture.